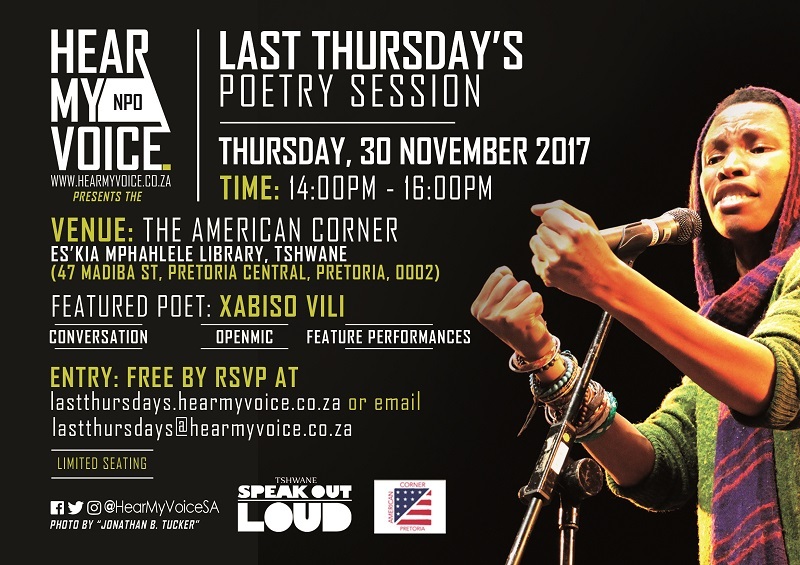 Hear My Voice hosts monthly poetry sessions at the American Corner situated within the Es'kia Mphahlele Library in Tshwane every last Thursday of each month. Hosted by Torsten "Clear" Rybka, each event features a conversation and performance by an invited poet as well as an open mic allowing the community to actively participate. Previous featured poets have included Anga Mamfanya, Poet Flow, Emmah Mabye, TSOL 2015 winner Xabiso Vili and 2016/17 season winner of the Tshwane Speak Out Loud Youth Poetry Competition Busisiwe Mahlangu. These events are free and open to the public. The Last Thursday's Poetry Sessions are presented in partnership with the American Embassy's American Corner and Tshwane Speak Out Loud.